The story of the refuseniks begins with the emergence of the Soviet Union in 1922. Read about the events that lead up to this dramatic time in our Historical Overview below. Play with the Interactive Timeline and discover photos and videos along the way. After a series of bloody revolutions and wars beginning in 1917, the Soviet Union (USSR) emerged in 1922 as a communist country. For the approximately 3 million Jews living there during the early years of the regime, there was room for cautious optimism. Anti-Semitism was not tolerated (officially at least), many Jews were active in the Communist leadership, and economic hardship seemed a thing of the past. Quite quickly, however, optimism ebbed. As authorities consolidated power, they worked toward the elimination of organized religion, with the official goal of establishing “state atheism”. Members of all religions – Russian Orthodox, Catholics, Baptists, Protestants, Jews – were targeted. Harassment, property confiscation, imprisonment, and the murder of religious leaders were all used to create an unforgiving environment in which organized religion ground to a halt. Parallel to this, the government mobilized ethnic groups for Communist purposes: ethnic groups could use their language, could write and read their own literature, could join and watch their own acting troupes, as long as the content was Communist, as long as it did not support a separate national sentiment or identity. Judaism suffered. Autonomous Jewish institutions disappeared. Communal Jewish leadership ceased to be. Hebrew language education and religious teachings were forbidden. Amidst the strong anti-religious stigma by the State and the media, the propaganda that all ethnicities and religions were irrelevant in the making of a “new Soviet man,” and in the violence, police state, and famine that was life in the USSR, Jewish identity slipped quietly away. In 1939, with the Soviet annexation of territories from Poland, the Baltic States, and Romania, the number of Jews increased to 5 million. In 1941, the Nazis invaded the Soviet Union. In addition to standard military units, the Nazis brought mobile killing units (Einsatzgruppen) to eliminate the Jewish population. Jewish Soviets who had shed their Jewish identities, were Jewish again, singled out for punishment by the Nazis and their collaborators. Although the USSR was eventually victorious, the country lost 30 million people, of them 2.5 million were Jews who were massacred by the Nazis. Post-war, Jewish identity was revived by a paradoxical Soviet policy. On the one hand, from a governmental perspective, the Soviet Union was made up of “Soviets”, not separate ethnicities, and to allow the Jews to publicly mourn Jewish victims would deny that “fact”. That is to say, Nazi victims were referred to as “Soviet citizens” or “civilians” and suppressed any mention of the Jews. On the other hand, the government aggressively pursued anti-Semitic policies. Jews were dismissed from certain professions. Jewish cultural organizations were dismantled. Jews were targeted in continual smear campaigns by the media, in which the Soviet public learned that Jews were involved in a conspiracy to bring down international socialism. Yiddish artists and intellectuals were arrested and murdered. Key Jewish personalities were imprisoned and sent to labor camps. Told that they were not Jews, but forced to be Jewish, the Soviet Jewish population was increasingly alienated from the general population. Beginning in 1953 with the death of Stalin, there was a quiet Jewish revival in the Soviet Union. It began with Jews connecting to other Jews in different neighborhoods and then cities, discussing Jewish topics, or listening to Israeli radio stations on shortwave radios. It continued with the underground production and dissemination of samizdat, uncensored texts, newsletters, and journals that explored Jewish beliefs, history, and identity. The government and the secret police continually pursued anti-Jewish policies and propaganda, although the intensity and coordination of the activities was uneven depending on the personalities in power and international affairs. The Six-Day War in 1967 initiated a new phase in Jewish consciousness in the Soviet Union. The Soviet government had supported Arab countries and had outfitted them with Soviet arms. The defeat of these countries by Israel, a fledging country, was not only a shock to the Soviet government, but a betrayal. While Soviet media pumped out anti-Zionist propaganda, declaring that all who supported the Zionist cause were enemies of the people, Soviet Jews began to feel not only pride in being Jewish, but to acknowledge a common national fate. Many Soviet Jews dreamed of moving to Israel, but making that dream a concrete reality was almost an impossibility. To emigrate from the USSR, one needed approval from the Soviet government. Most Jews who applied to leave were rejected. These rejections were generally given without explanation, although some applicants were told that they knew “state secrets” that could be divulged to the West. The applicants were then in a “state of refusal” and became known as “Refuseniks”. This period lasted months, usually years, and sometimes even decades. Perhaps the feeling of imprisonment would have engendered psychological damage on its own, but it was coupled with the harsh realities of being in a “state of refusal.” Having made the request to leave, the Refuseniks were treated as enemies of the state: they lost their jobs or were demoted, they lost their homes, and they were continually followed and bullied by the secret police. Many were arrested and imprisoned on imaginary or trumped up charges (prisoners who were arrested for Jewish practice or pro-Zionist activities are called “Prisoners of Zion”). The Refuseniks responded in two central ways. On the one hand, they continued to build their Jewish lives—covertly, of course—whether it meant teaching or learning Hebrew, celebrating the Jewish holidays in the forests where police surveillance was difficult, or congregating with other Jews to learn Jewish history and texts. They found meaning in Jewish expression whether their connection to Judaism was secular, traditional, or religious. On the other hand, the Refuseniks publicly challenged the government by writing and distributing letters of protest to the media, and passing on details of the harassment and injustices to Western journalists and government officials. Their behaviors became more and more audacious, including a planned hijacking of an empty plane, to get attention. The courage of the Refuseniks fired up the passions of the Jews of the West. In the 1970s, memories of the Holocaust lay heavily on the Jewish community, and many Western Jews could still point to far-off relatives living behind the Iron Curtain, their ancestors having emigrated to the West from Eastern Europe. Western Jews threw themselves into protesting the status of Soviet Jews: organizing marches and candle vigils, reaching out to their congressmen, and facilitating media coverage. They created organizations, raised money, and sent activists to the USSR to see conditions for themselves. They regularly communicated with Refuseniks by telephone and mail, to keep current with the situation and to offer help where they could. They pressured politicians into including human rights clauses and Jewish emigration into legislation that governed American-Soviet relations. At some point, a cycle emerged: the spirited behaviors of the Refuseniks emboldened the Western Jewish activists, while knowledge of Western support heartened the Refuseniks. Risks increased on the side of the Refuseniks as arrests, bogus trials, and real imprisonments skyrocketed, and Western Jews amped up their campaigns, sharing the plight of the Soviet Jews with the world. The Soviets responded in a confounding way. They allowed some Refuseniks to emigrate, jailed others, and kept the majority in limbo, in a state of refusal. As dismal as the situation was, the exit visas obtained by some Refuseniks demonstrated that pressure had an impact—there was hope. By the mid-1980s, the USSR was stagnant, its economy barely functioning, and its population bent under the weight of a police-state. 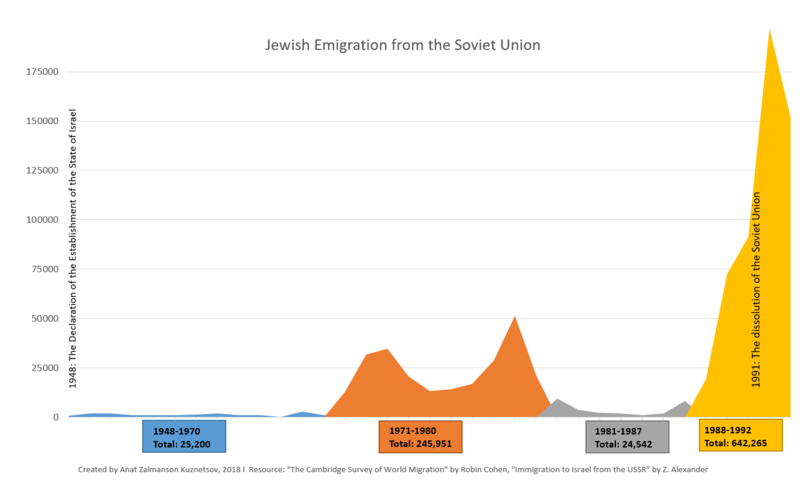 International support for the Refuseniks was at its height and Jewish emigration at a low. Thousands of Refuseniks were waiting to receive exit visas; hundreds of Jews were imprisoned in gulags and jails in remote parts of the country for daring to demonstrate Jewish or Zionist behaviors. Change came in the form of Mikhail Gorbachev, a young politician who, over time, recognized that the situation was untenable. Slowly laws were passed allowing more freedom of speech, more economic freedom. Activists were released from prison, including Prisoners of Zion. Beginning in early 1987, Refusenik cases were reviewed and exit visas issued. In 1986, only 904 Jews had been given these visas—by 1987, the number jumped to 8155. In 1988, the Soviets permitted Israeli officials to reopen the Israeli embassy, which had been closed since the Six-Day War. Immediately, would-be emigrants formed long-lines outside the embassy, desperate for exit visas from the USSR. In this environment, Jews began coming out of the woodwork, establishing Jewish organizations—research centers, libraries, cultural associations—in large Soviet cities. But for many, this was too little, too late. The liberalization allowed Jews to recoup their identities as Jews and perhaps to build a full Jewish life, but at the same time, it meant that latent anti-Semitism, held in check to a certain extent by state policies, was now rampant. By late 1989, and until the total collapse of the Soviet Union in 1991, emigration had become practically free. Close to half a million Jews left in the space of a two year period (of these about 70% went to Israel), with another million Jews joining them in the decade after. Chronology of Major Events was prepared by Yuli Kosharovsky and Enid Wurtman, with the help of Pam Cohen and Jerry Goodman. You can see their original work here: http://kosharovsky.com. The interactive timeline below was edited by the Refusenik Project team. Over time, Zionist, religious, and other Jewish activists perish or suffer in the Gulag system. Jews removed from positions of leadership. Death of nearly 30 million Soviet citizens recorded, including 2.5 million Jews. When​ Golda Meir returns to Israel, she begins to form the secret government office, Nativ, to aid Soviet Jews leave the USSR. Stalin dies on Purim and the trial of the doctors is cancelled. It later becomes the Union of Councils for Soviet Jews. 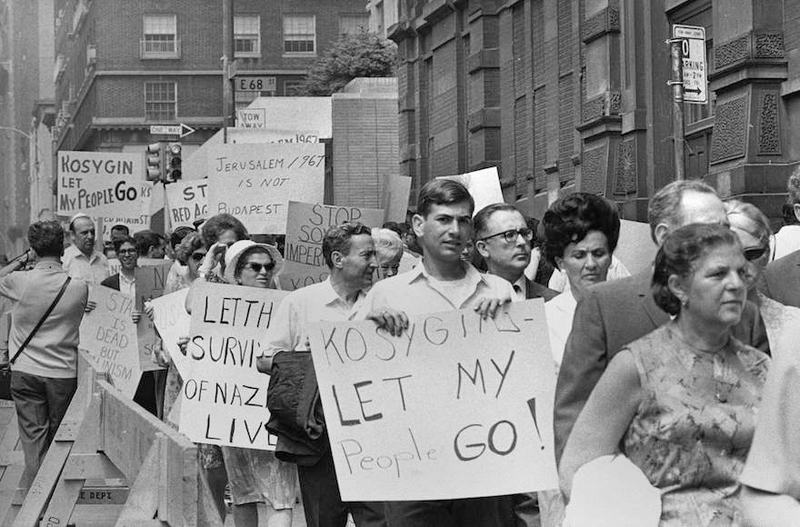 Over the next decade, many other advocacy groups are formed..
For the next 25 years, there are massive public demonstrations for Soviet Jewry across the West. In response, thousands attend a National Eternal Light Vigil, the first public demonstration in Washington, DC. 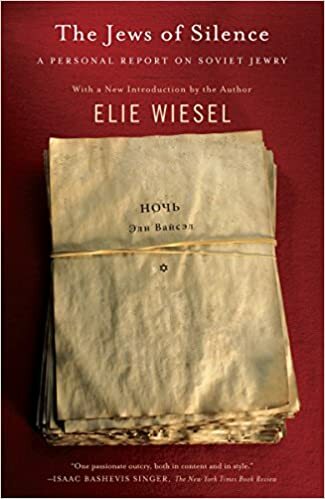 It highlights his encounters with Soviet Jews and the silence of Western Jews in the face of their plight. Their appeal captures the attention of the Western media. In the USSR, a secret committee (VKK) is created by Jewish activists in the Soviet Union, to coordinate efforts. In response, 39 Soviet Jews send a letter of protest to the Soviet Foreign Ministry. The letter is leaked to the West and fueling a wave of protests and public appeals. The arrest and trial galvanized major international support. Pressure from the West led the USSR to commute death sentences and allow hundreds of thousands of Soviet Jews to emigrate. It is considered to be a “ransom” tax meant to deter Jews seeking to leave for Israel. Word of the education tax stirs protests in the West. This becomes the Jackson-Vanik Ammendment in 1975, the most effective legal tool in the fight for Soviet Jewry. The Act, among other things, focused on human rights. The document becomes a global instrument used to improve human rights in the USSR, especially Jewish emigration. This serves as an invitation for harassment and violence. This is seen by Washington as a Soviet challenge to the humanitarian provisions of the Helsinki Final Act and an obstacle to US-USSR détente. This period can be considered the real beginning of perestroika in the field of human rights. The event marks the peak of the Soviet Jewry advocacy campaign in the US.